Yes, people do feed guinea pigs to snakes, that is why no one should offer them free in newspaper ads. This particular place was a crummy pet store. My friend bought him and his sister before they were fed to their snake. Then I took him. Sometimes I guess you have to rescue them from pet stores too. Sometimes, yes, it does become apparent that it is in the best interest of the animal. I once saw and ugly old white guinea pig ( hard to believe, I know- but I am being honest here ) with a big metal tag ( um, hello, lab?!) in his ear at PetStupid for something like 6 months. It was breaking my heart to see him. Our first guinea pig was from a pet store. 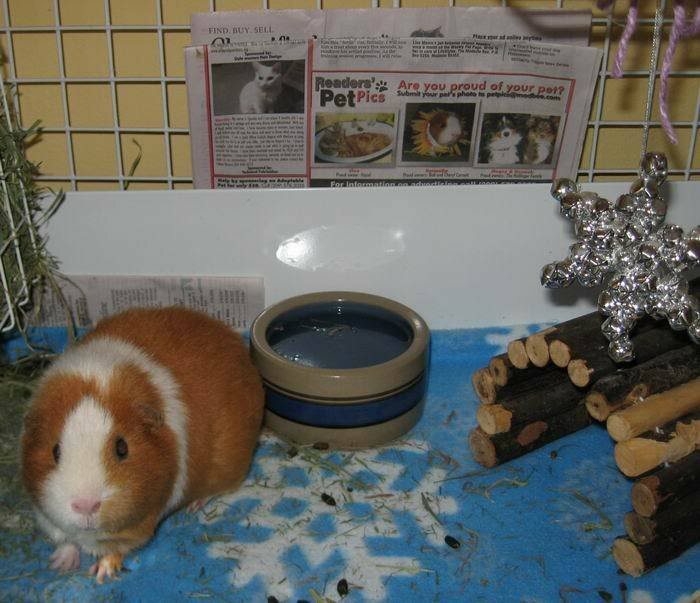 We got him before I knew of such a thing as a cavy rescue or that animal shelters have so many poor homeless piggies. Although the other three piggies we've had have all been rescue pigs, I don't regret buying Reese for a moment. As you said, sometimes we need to rescue from a pet store. Reese was older than all of his cage mates at the store because he had been there for two weeks longer. The lady said no one would buy him because he was so ugly. He was actually an absolutely gorgeous agouti--so gorgeous that a woman later offered me money to use him for breeding (I said no.). Only the tri-color pigs were being purchased, so he was about to be returned to the breeder for God knows what. Anyway, while I'm standing there watching him nibble on the sign that listed the price of a guinea pig, a guy showed him to his girlfriend. Seems his snake had gotten too large for single rats and she refused to let him feed a bunny to a snake. He had chosen Reese because he was the largest of the pigs, the others not being much larger than a rat. I heard this and couldn't imagine such a cute little guy becoming snake food. I told the guy that we had already agreed to buy the little guy and were just waiting for something to take him home in. The man was ticked and stormed out to go buy rats. My husband walked over and said, "Did we just buy a guinea pig?" I've been hooked on piggies ever since. You don't rescue from a pet store - you buy. Your purchase puts $ into the pet store's pocket and is replaced by two more babies from their pet mill/breeder. Very few people are going to pay $30 for a guinea pig to feed one to their snake. Here is a little bit about the system pet store animals come from. It is a horrible hell from beginning to end. From mill breeder to broker to distributor to retail outlet, this entire system promotes impulse purchases of living beings as things, sold along with inappropriate supplies to people who want a temporary toy with no intention of ever properly caring for them for life. I've no doubt you saved Reese's life, and I'm sure you love him. Many (if not most) of us started out where you are, and it's to your credit you now adopt from rescues. But the link above will give you some idea of why we are so adamant the system should not, and cannot, be supported in any way, shape or form. Carmella made the local newspaper! Her image now sits in some 80,000 households. I wish I could give you a link, I searched online, but could not find one. It is a picture of her in her brown-eyed susan costume. I could barely believe my eyes when I saw it early this am. I was so excited I crinkled the page running it out to Mr. Wheekers, who was warming his car up in the driveway. Yay, Carmella! How cute. She has been sneaky, hasn't she? Carmella, you are a star! She deserves to be in every paper in the country. Oooh lala, that is so cool. The expression of Carmella standing in front of the newspaper is priceless,..
"who, me, famous? Why thank you. "Hey, How much ju wan for da peeg?" It was a friend joking. It had Mr. Weekers going for a second. Now we make make jokes about how she might get pignapped etc. Her head is going to be too big for her pigloo. I read this for the first time today and the stories brought tears to my eyes. Especially since I have spent the last hour googling trying to find out what the university might really have done to all those lab piggies. I found some disturbing stuff. Even without details it bothered me. And then reading this right after, made me even more glad to have given two of them a new home. So I have to make the intros work out somehow now. Thanks for making this story a sticky Lynx. We had our traditional homeade carrot cake after dinner that night. Her gift was some new carpeting for her upstairs loft and ramp. Where does time go? Too fast for such a sweet pig. Wow. Six years old and four of them in your happy home. That's awesome. When someone buys from a pet store, they may not be aware that they not only support the cruelty, cavalier neglect and abuse rampant in retailing, but an entire chain of abhorrent practice. Most petstore pigs come from huge mill breeders. Nearly everyone has heard of the horrors of puppy mills, but any animal can be "milled" ... and nealy all of them are. Those that make it out of a mill breeders' enter a chain of brokerage and wholesale distribution every bit as horrific. Those that make it out of there end up in your local petstore. Break the chain. Opt to adopt. Being 6 now and in the throes of winter and high heating bills, I am utilizing Suey's old reptile heating pad. I can keep the house a little cooler and still not worry about her being cold. I find her on it most times, so I know it is appreciated. It keeps the back mouth of her tube upstairs just a little warm. The cord is well hidden and covered with automotive looming, in case somehow ( very unlikely ) she gets a chance to nibble it. She is small and frail, and we love her so much. She celebrated her 7th Birthday last night. We had the usual guinea pig birthday cake here, a homemade carrot cake with cream cheese frosting. She is so tiny and sweet. Also still loving her reptile heating pad. I cannot stress how good that is for an elderly GP accessory in wintertime. She got a package of heirloom 3 color carrot seeds.